As the world’s leading learning company, we are in a powerful position to push the agenda for literacy and learning on a global scale. Our businesses take this responsibility seriously, supporting Pearson people in their charitable endeavours, responding to local disasters and lending their weight to international causes in our areas of expertise. We invested £13.1m in our local communities in 2010, through our businesses, supporting the work of our staff and via our charitable arm. In partnership with The Pearson Foundation, our philanthropic arm, we focus our efforts on four areas: literacy, teacher quality, education leadership and youth engagement. We work with The Pearson Foundation and others to extend and share our business skills and knowledge. The activities of the Foundation are varied, numerous and international – from supporting education initiatives for young girls in South Africa to digital initiatives for teachers in the US – so we've highlighted one initiative from each of our target areas. The Foundation supports the Council of Chief State School Officers' (CCSSO) Teacher of the Year award annually, finding and recognising the best teachers across the United States with a series of videos on why they teach. The Foundation partnered with Organisation for Economic Co-operation and Development (OECD) to produce a series of investigative films, Strong Performers and Successful Reformers in Education. The first four films in the series were shown to coincide with the OECD's release of the Programme for International Student Assessment (PISA) annual results in December 2010. In August 2010, the Foundation launched the Pearson Fellowship for Social Innovation with TakingITGlobal, an award-winning online community of youth who are working for change. Young people completing the Taking IT Global Sprout e-course will be able to apply for the Fellowship from January 2011, to get support for the launch of community project they design and plan during their Sprout studies. Each business group has its own community budget which is used to match the fundraising of our people, to support local charities and make donations to non-profit groups involved in learning and literacy. Alongside charitable donations and sponsorship, Pearson businesses partner with NGOs to highlight particular local causes or international concerns. Following the devastation of the Sichuan province earthquake in 2008, Pearson people in China and across the world responded to raise hundreds of thousands of pounds for disaster relief. Following a discussion with the Sichuan Government on how best to support education for the needy students in the area, Pearson China helped to establish a branch of the Bainian Vocational School (BNVS) in Chengdu, Sichuan, in addition to supporting its first class of students. When another earthquake hit the neighbouring Qinghai province, The Pearson Foundation matched the money raised by people in Pearson China – these funds were in turn donated to BNVS Chengdu to support students attending the school from Qinghai. A follow-up visit to the school from Pearson China staff in 2010 found the school thriving and lively, and was accompanied a donation of DK books in Chinese, Longman dictionaries and English language Penguin Readers to support the school library. We support our people in their own community involvement, matching their fundraising and providing volunteering opportunities in work time. We celebrate our Pearson volunteers by inviting anyone in the company to apply for the annual Pearson Community Awards, with a $2,000 prize for up to seven recipients to donate on Pearson's behalf to their charity of choice, in addition to a $500 'thank you' to the volunteer. In 2010, we put plans in motion to introduce a similar set of awards to acknowledge individual and team work to reduce environmental impacts. Pearson staff in the UK take part in our Give As You Earn scheme, donating money to charities of personal choice every month. Pearson plc matches these donations annually up to the value of £500 per person, totalling a £72,000 fund match in 2010 for nearly £100,000 given by our people. In 2011, we will explore how to implement a similar initiative in the largest part of our business Pearson North America. 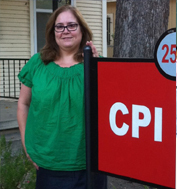 Lauri worked her way up the Crime Prevention Institute (CPI) since she first began volunteering with them at a fundraising event four years ago – she is currently serving as President of the Board of Directors. CPI provides wrap around support to non-violent offenders while they make the transition from Travis State Prison, Texas, back into every day society. CPI's social workers meet with an individual while they are in prison, then help with housing, employment, transportation, family concerns and other issues after their release. Lauri chairs monthly meetings, attends many events and functions, and networks heavily for the charity to help boost its fundraising efforts. CPI is able to achieve a lot with a small budget – Lauri's award from Pearson could fund a member of staff full-time for the remainder of the year, or sponsor two clients to take part in the entire CPI programme, including pre-release education, transitional services and post-release case management.